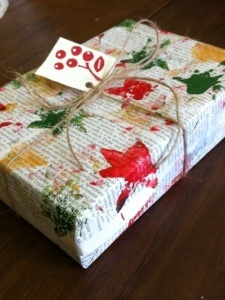 Today’s Christmas craftiness began with a potato and an old book, and ended with creative and cute gift wrapping! I love collecting old books when op shopping, to use for a myriad of purposes. This is another thrifty way to cut down costs of Christmas and make it more personal. I carved some rough star shapes into a potato, ripped some of those old book pages I so love to use, got out some paint, and here you have it. Stamp the potato in the paint, I used green, red and gold. 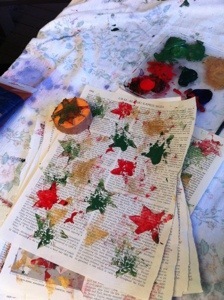 Then go crazy on your recycled vintage paper. I wanted a rough and natural style, so the stars aren’t always distinguishable in my pattern, but you can definitely be more meticulous. Easy peasy, and another great one for kids to help with. My gift tag is an old Kikki K bag cut up, and some cute brown twine will top off the natural design. Have fun! 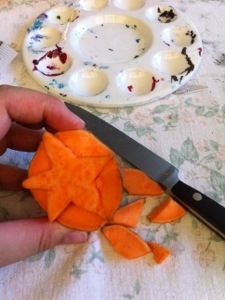 This is a great thrifty present idea, delightful, delicious, and much easier than you think. 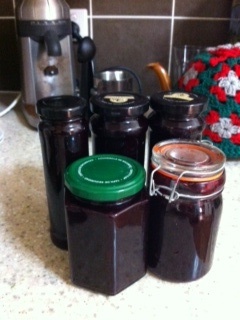 It’s a bit more effort than a voucher but people love home made gifts. Put everything in a pot, mash the blueberries up a bit with a potato masher, and cook for about 35 minutes, or until thick. Put a plate in the freezer, drop some jam on it, put it back in the freezer for 1 minute, and if it forms a skin it should set fine!